This is the third iteration of web site I have created over a period of 10 years for this organization. In this latest revision, control of much of the content was turned over to the staff. 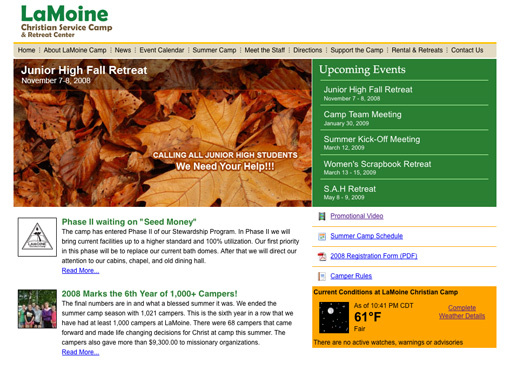 The event calendar, camp schedule, news articles, and home page features are all controlled by a custom administrative area requiring a login and password. There is a lot of additional functionality provided by the web site. Visitors can subscribe to the event calendar and view it from iCal or Outlook or Google Calendar. People missing out on the camp fun can see what the current weather conditions are at the camp. And coming in 2009, online registration will be available for all summer events.